Whisk all ingredients together and let stand 1 day in the refrigerator to let the flavors meld. An excellent sauce for ribs or especially pulled pork as the pork will soak in the sauce. With the omission of the ketchup this turns into an excellent mopping sauce for smoked ribs or pork. For the pork chops: Preheat oven to 325°. Pre-heat a frying pan on medium and add 1T unsalted butter. Season chops with salt and pepper and sear in frying pan until browned on both sides. Place in shallow baking dish and pour over BBQ sauce so it's about 1/2" deep in the pan. Bake in oven 20-30 mins. 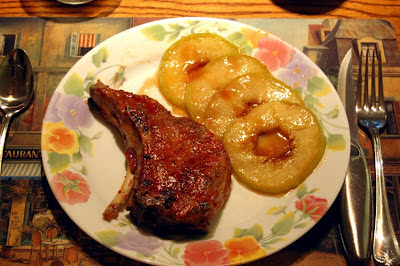 Click this link (Facebook) for the Fried Apple Recipe. Can I do this recipe in a Barbecue grill? I practically want my meat to have the beautiful grilling marks, it actually adds appetite to the dish. Sure, I don't see why not. The original recipe just called for cooking in the oven and I don't have a grill so haven't tested it yet. Thanks for the comment.